A day tour designed to equip leaders to review and edit decisions and activities based on a larger understanding of God’s defined purposes for their lives and work. The Street Works Tour works participants through the Creel Model,SM a discovery process built on the big idea that God cares how and where and for whom we are at work. The Creel Model is a filter for discerning personal and organizational health at a high level and isolating ineffectiveness, brokenness or exposure. The overarching admonition for participants is national quality (excellence in thinking, decisions, actions and activity). The Street Works Tour is designed as a turnkey event for sponsorship by like-minded, oversight organizations in cities across the country. Tour administration and logistics—including pricing and promotion—are the responsibility of the sponsoring/hosting organization. The Creel Institute has set a standard fee for tour content. Please ask for more information. Who is the tour speaker? Laurie Carney, co-principal/partner of the Strategy Group, a full-service strategic marketing firm serving businesses and organizations across all industries and home to the Creel Institute, will facilitate The Street Works Tour. Laurie and her husband and business partner, Jeffrey, authored the book Minding the Gap—a planning and editing manual based on the Creel Model. The Carneys are strategists and strategic communicators who believe God calls believers and believing organizations to be contagious, articulate and effectively present in the marketplace of ideas. They are invested in helping servant leaders achieve the highest level of effectiveness and productivity—strategically, conceptually, creatively and operationally. The believer and believing organization are God’s intellectual property, called to national—Kingdom—quality and accountable to uphold the values and quality of Jesus in everything we do. Our attitude, countenance, language, actions and steadfastness either exemplify Jesus or betray him. We desire that God’s brand be an electric brand, a powerful brand. And we believe every shade and nuance of identity counts to either differentiate us as God’s giants in today’s cultural war or, devastatingly, dismiss us. How is the Street Works Tour organized? 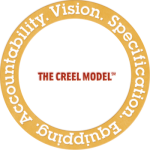 The tour day is defined by the four tenets of the Creel Model—vision, specification, equipping and accountability. Why does this kind of retreat content matter? Jesus gave us branding instructions 2000 years ago. We are called to be salt and light. Using 21st century vernacular, that means alive, engaged, savory, bright, deep. God cares about our identity on this earth. He forms us with the brand DNA—the unique voice, gifts and disposition—to count in specific ways in specific places for specific people. He invests his passion—compassion—and purposes in us and gives us opportunities to choose to use them. Only when we begin to see ourselves as God sees us—when we uncover his brand on us and in us to be people who love deeply and serve out of the uniqueness of our gifts—do we begin to stretch into the purposes he has defined for us. When we come fully into our understanding of his brand on our lives and begin to trust him to live and work through us, our God-given potential explodes. The cultural war is being fought today on brand soil. We can’t, as believers, dismiss branding as a secular concept. We’re not excused from the front lines of this war because we fight a higher battle, a spiritual battle. The cultural war is a spiritual battle. It’s a battle for our time, treasure, attention and commensurate actions. In our lives as believers, it’s a battle between self-consciousness and Christ consciousness. Between the world’s brands and God’s brand. What follow-up initiatives are in place? The Creel Institute offers a number of solutions designed to help organizations effectively implement the Creel Model. Click on “services” and look for specific solutions in the drop-down menu. We also offer a 10-session Creel coaching program for individuals who desire to engage in a deeper discovery process based on The Creel Model. Creel coaching strictly follows the book, Minding the Gap—A planning and editing manual based on the Creel Model. Creel coaching is designed to provide an accountability system, check point and discussion opportunity for the individual who a) is too busy and distracted to work through Minding the Gap on his own, b) desires guidance from someone with deeper experience, or c) enjoys structured accountability. Click here to meet our Creel Model facilitators. 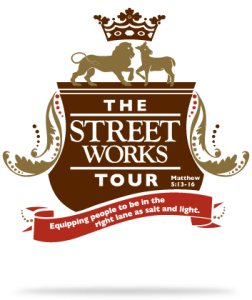 For more information about The Street Works Tour or to explore hosting the tour in your city, contact Gail Derreberry, resource director of the Creel Institute, at 316.706.6331, or complete the contact us form to send an email. Are you interested in bringing The Street Works Tour to your city? Understand what it means to be vision-inspired and vision-directed. See more clearly God’s purposes for their lives and work. Learn how to be contagious image bearers, equipped with the elements of a platform for understanding their God brands. Learn to discern how their organizations are differentiated, who they are uniquely called to serve and in what capacity. Understand what it means to break through the clutter and noise of the marketplace of ideas and win people to the purposes in which God has invested them. Understand the elements of a strategic roadmap and be encouraged to take next steps to be effective and productive. Leave with the discovery process and tools to invest or reinvest critical stakeholders.